Eclipse is a platform that has been designed from the ground up for building integrated web and application development tooling. By design, the platform does not provide a great deal of end user functionality by itself. The value of the platform is what it encourages: rapid development of integrated features based on a plug-in model. 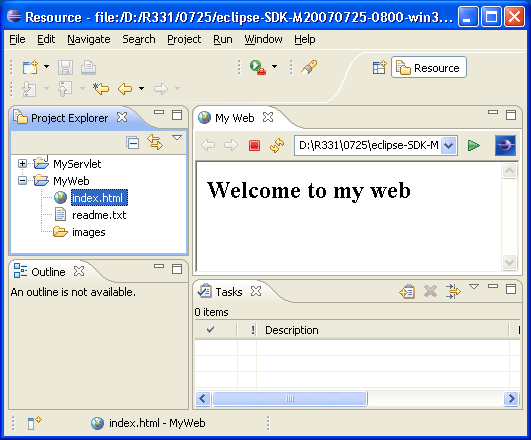 Eclipse provides a common user interface (UI) model for working with tools. It is designed to run on multiple operating systems while providing robust integration with each underlying OS. Plug-ins can program to the Eclipse portable APIs and run unchanged on any of the supported operating systems. At the core of Eclipse is an architecture for dynamic discovery, loading, and running of plug-ins. The platform handles the logistics of finding and running the right code. The platform UI provides a standard user navigation model. Each plug-in can then focus on doing a small number of tasks well. What kinds of tasks? Defining, testing, animating, publishing, compiling, debugging, diagramming...the only limit is your imagination. The Eclipse platform defines an open architecture so that each plug-in development team can focus on their area of expertise. Let the repository experts build the back ends and the usability experts build the end user tools. If the platform is designed well, significant new features and levels of integration can be added without impact to other tools. The Eclipse platform uses the model of a common workbench to integrate the tools from the end user's point of view. Tools that you develop can plug into the workbench using well defined hooks called extension points. The platform itself is built in layers of plug-ins, each one defining extensions to the extension points of lower-level plug-ins, and in turn defining their own extension points for further customization. This extension model allows plug-in developers to add a variety of functionality to the basic tooling platform. The artifacts for each tool, such as files and other data, are coordinated by a common platform resource model. The platform gives the users a common way to work with the tools, and provides integrated management o f the resources they create with plug-ins. Plug-in developers also gain from this architecture. The platform manages the complexity of different runtime environments, such as different operating systems or workgroup server environments. Plug-in developers can focus on their specific task instead of worrying about these integration issues. The plug-ins that make up a subsystem define extension points for adding behavior to the platform. The following table describes the major runtime components of the platform that are implemented as one or more plug-ins. Defines the extension point and plug-in model. It dynamically discovers plug-ins and maintains information about the plug-ins and their extension points in a platform registry. Plug-ins are started up when required according to user operation of the platform. The runtime is implemented using the OSGi framework. Defines API for creating and managing resources (projects, files, and folders) that are produced by tools and kept in the file system. Implements the user cockpit for navigating the platform. It defines extension points for adding UI components such as views or menu actions. It supplies additional toolkits (JFace and SWT) for building user interfaces. The UI services are structured so that a subset of the UI plug-ins can be used to build rich client applications that are independent of the resource management and workspace model. IDE-centric plug-ins define additional functionality for navigating and manipulating resources. Defines extension points for plug-ins to provide help or other documentation as browsable books. Defines a team programming model for managing and versioning resources. Defines a language independent debug model and UI classes for building debuggers and launchers. Other utility plug-ins supply functionality such as searching and comparing resources, performing builds using XML configuration files, and dynamically updating the platform from a server. Out of the box - or off the web - the basic platform is an integrated development environment (IDE) for anything (and nothing in particular). It's the plug-ins that determine the ultimate functionality of the platform. That's why the Eclipse SDK ships with additional plug-ins to enhance the functionality of the SDK. Your plug-ins can provide support for editing and manipulating additional types of resources such as Java files, C programs, Word documents, HTML pages, and JSP files.